In this last installment of the "Parents Take Charge" series our goal is to offer additional resources to help educate you and your family to maintain a life of wellness.We are constantly bombarded with new diets, exercise regimens, foods and supplements. It is difficult but imperative to sort out the truths from myths and fads motivated by our marketing-driven world. Parents, you are in control and responsible for your children's well being. Take charge and educate them on healthy living. As adults we take responsibility for our actions and choices; children however, rely on their parents for proper actions and choices. Take responsibility now and help your children make the proper choices to develop lifelong healthy habits. You would not allow your children to smoke, so why would you allow them to eat foods on a consistent basis that could make them overweight or obese which can lead to most major illnesses? Obesity is a preventable killer. When helping your children lose weight or prevent weight gain, it is important to encourage them to do it healthfully by maintaining a way of eating and activity they can enjoy most of the time. Research shows that maintaining a healthy weight can often be more difficult than losing weight. Finding a balanced diet and regular exercise is what keeps the weight off. 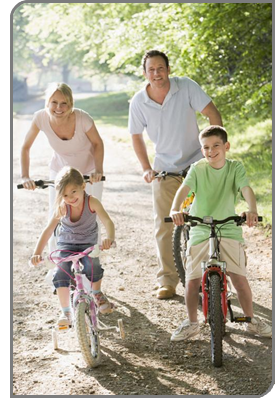 For tips from past articles on how to help your child eat healthy or exercise more, click on the colored text. We live in a society that likes to think "everything in moderation" is the way towards a life of wellness. The reality is that not everything is good in moderation. Today the quote "everything in moderation" is often used to justify poor choices we continue to make over and over again. Striving for balance may be more appropriate when it comes to wellness and wholeness. Our bodies are in a constant state of equanimity and will do what is necessary to find a state of balance. For example if you were to starve yourself through an extremely low calorie diet, your body will recognize it is in a state of emergency. It will slow down all bodily functions, including metabolism, to conserve energy and save reserves. When you go off the diet your body is not as efficient at burning calories because it has been in a starvation-survival mode. You have slowed down your metabolism as well as cannibalized your muscles (which are metabolically active and increase the amount of calories you burn) for fuel and daily functioning. This is why you will gain back the weight plus some, if you lose it too fast by restricting your caloric consumption too drastically (yo-yo effect). Because our body strives for balance and health it will do whatever is necessary to function and serve us the way it was designed to for as long as it possibly can. If we continually subject ourselves to harsh conditions through poor health habits our bodies will eventually break down, and that is when disease takes hold. Although change can be very difficult it is necessary for well-being. If we don't change, we don't grow! If not now then when? It is a good thing to be aware and be in the know. A sannyasin is a seeker of truth. Baron Baptise, an enlightened Yogi Master, said in his book 40 Days to Personal Revolution "we change by being and doing with a pure intent... real health means wholeness on all levels". He also said "Once we accept responsibility for ourselves, we can become our own teachers, healers and motivators". We all know deep down what we need to be doing to live a life full of wellness and wholeness so take right and true action. With patience and thoughtfulness you can make a difference in your and your child's life. Journalists seek out headlines everywhere and scientific conferences are no different. Much of the research presented in the media is preliminary, has not undergone peer review and may never be published in leading medical journals. Many headlines are lacking in scientific conclusion, are misleading, sometimes dangerous and simply not true. Nevertheless they sell newspapers. Observe headlines with skepticism. Since staying healthy is a life long process it is important to keep abreast of all the factual information that you can. The Six Dimensions Newsletter is a great new resource and one of a few that is offered online FREE. In addition, listed below are highly recognized and trust worthy newsletters, journals and websites on current health issues. All are informative and easy to read. Kiersten K. Mooney has a degree in Sociology, Exercise Sports Science and Sports Medicine from the University of Miami. She also attended many graduate courses in Exercise Physiology and Nutrition.